Depends on the bolt. A grade 5 bolt ( same as original on CC's) will not be much different as long as you weld and then heat the whole assembly red and cool slowly. Makes it not to brittle and bend rather then break. Isn't $47 for two bolts tack welded together a bit steep? Well not tack welded together. Since you asked. 4 Bolts 2 special order because of the pitch ($7.25 for all). The bolts heads are turned on a lathe and undercut the heads at a 30 deg angle. They are then TIG welded around the entire bolts. Then they are stress relieved with a torch (guy charges me $18 a set), then of course we paint them, and shipping is around $7 in a small box in the CONUS. So I would make less then $15 per set. That might cover my effort. Had a good idea and if someone does not want to go to the trouble of doing this on there own then have at it. I thought folks might like the idea, not trying to get rich LOL. Thanks for the explanation, I first saw this yesterday and did not really think about it until I looked at it again today and $40 seemed like a lot for a few bolts welded together. I was not trying to down play your idea. I actually do think it is a good one, the pegs look good there. I just got my canyon cages in. was going to put them on in the next few days. anything i need to know about this? "do this first to make it easier"
Get some blue painters tape and tape the edges of the fairing. 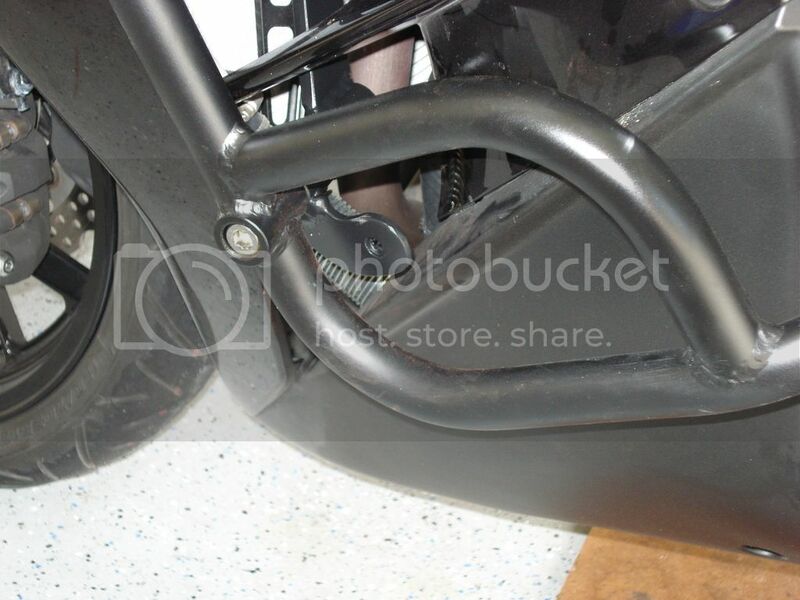 On the right side is difficult getting a socket wrench in there I was slightly scraping my fairings. Painters tape solved that and peeled right off. 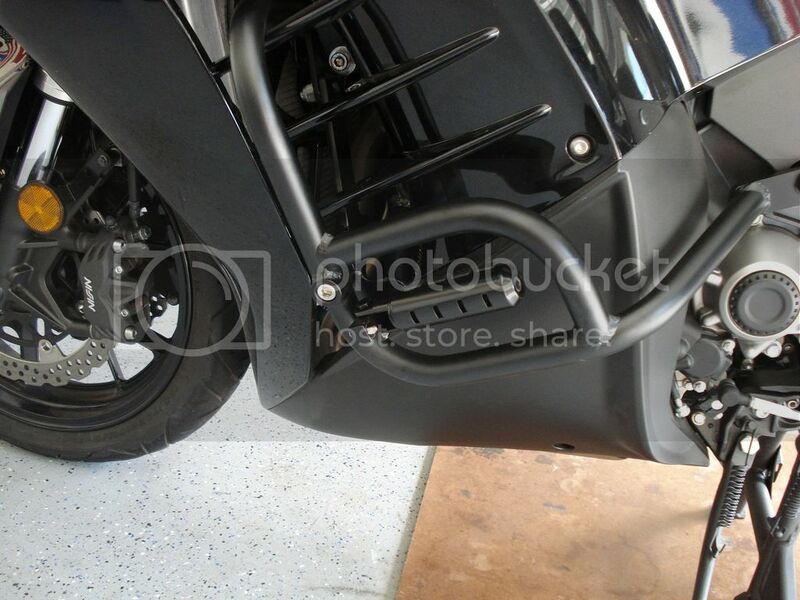 You will also need a second set of hands to hold the bars while you are dealing with the hardware. Just so you know the above will work - but there is more then one way to skin a cat. It can be done with only one set of hands as I did mine solo and didn't have a problem installing them. I used a T handle Allen wrench which allowed me to use a pipe on it for more leverage which worked good. I also went out a got a tap to clean out the thread lock that was left in the threaded holes. It's a 10x1.75 mm tap I THINK - check for yourself before you buy one. I did get them on last night by myself. all went well and they look good. have to adjust my highway pegs im sure, but they felt good in the garage. Really nice set up...like the way they tuck out of the way. Wish I would have saw this before I mounted mine today. Got the welded bolts from n3nman. Fit great, instructions were very helpful. Everything went together very well. I know this post is a little old now but I was thinking about picking up a canyon cage and i was wondering if you are still making these? Still making them. A few here and there. Let me know if you want a set. I installed pegs on my Canyon Cages using the bolts from n3nman. It works great, as advertised, and is worth the money! 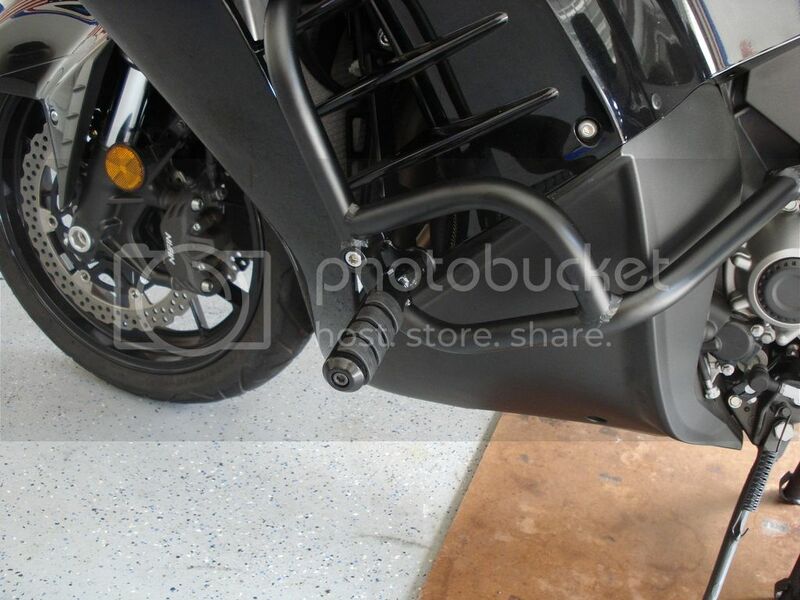 Highway pegs greatly increase the comfort of long-distance riding. I have no issues with comfort using the stock seat when I can adjust my legs while riding. I’m new here and have been doing some research on highway pegs. Is there any way you could upload some pictures again for the newbies like me to see how you mounted your pegs? Miguel, just click on the missing pic links and you should be able to see the photos. Thanks for the tip. I was able to to see them like that. Page created in 0.533 seconds with 26 queries.